Pisa boasts one very famous tourist attraction, and several less iconic places of interest. There are cheap flights to Pisa Airport thanks to BMIBaby and Ryanair. You can travel on to nearby Florence, tour Tuscany, or spend a pleasant weekend break in Pisa itself. Pisa is a historic town in Tuscany, near the mouth of the Arno river. Once a city of political and cultural importance, Pisa is now most famous for one of its architectural masterpieces, the Leaning Tower. Travelling through in the 1760s, notoriously critical Tobias Smollett found Pisa a 'fine old city' and admired the town's elegant palaces and 'majestic solitude'. Modern Pisa - away from the tourist hub - still has a quietness and an air of a town that has seen greater days. A thousand years ago, the naval town ruled a miniature empire, including Corsica, Sardinia and the Balearics. An influential power, Pisa was also the home of mathematician Fibonacci and the celebrated Galileo Galilei. Like Rome, Venice and Amalfi, Pisa's pride came before its fall, and as rival Genoa conquered the seas, and the Arno silted up, Pisa's light began to fade. Today Pisa is an important university town, with a population of 100,000, and a major tourist destination. Daytrippers flock in to marvel at the Leaning Tower of Pisa. 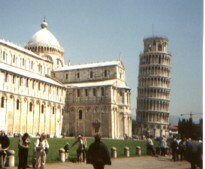 Pisa's principal tourist attractions are grouped together in the Campo dei Miracoli, the Field of Miracles. It's hard to believe the place is real; the tourists flocking around are the only thing that gives the surreal scene a touch of reality. The setting is a flat space, green with lawns, at the edge of the town centre. Here rise the town's cluster of monuments, all architecturally exquisite, and all leaning at different angles. There is a grand Romanesque cathedral, a large striped baptistry, and, of course, the Leaning Tower. Also in the Campo dei Miracoli, another curious sight is the Campo Santo, the Holy Field. This is a cloistered cemetery, said to have been laid with earth brought back from the Holy Land by the Crusaders. Bombing in the Second World War destroyed some of the works of art that were stored in the surrounding buildings; some frescoes remain, however. In the same area are two museums, the Museo del Duomo (cathedral museum) and the Museo delle Sinopie, which contain art and sculpture from the monuments. Elsewhere in Pisa you can wander peaceful streets, admire the town's palazzi and university buildings, shop in the market areas, and admire bridges and churches. Among the most attractive churches are Santa Maria della Spina, a Gothic masterpiece on the banks of the Arno, and the octagonal Sant'Agata. The Museo di San Matteo contains art by local artists and others, including the Pisano family, Fra Angelico and Brueghel. For those with an interest in the Romantic poets, Shelley's body was brought ashore at Gombo, close to Pisa, and cremated on the beach. Pisa Tourist Information Office is situated on Via Cammeo, not far from the Leaning Tower. There is another branch just outside the main railway station. Pisa Airport is named Galileo Galilei after the town's most famous citizen, and is little more than a mile outside the town. The airport has its own railway station with trains to Pisa and Florence. City bus number 3 runs from Pisa Airport into the town centre; tickets cost €0.80 each way. There is also a coach service into Florence. Pisa is very accessible from other parts of Italy. The town is on major trainlines connecting with Rome, Florence, Genoa, Milan and Naples. The main railway station is called Stazione Centrale, and is about twenty minutes walk from the centre. Bus number 1 runs directly from the station to the Campo dei Miracoli. > Advice about booking hotels in Italy.